Caption slip reads: "Photographer: Monteverde. Date: 1958-01-09. Reporter: Tarpley. Assignment: Pomona shooting. 51-52: Mrs. Cathleen Hall, 34, of 1431 West Grand Avenue, Pomona, wife of estranged husband shot by ex-Pomona cop. 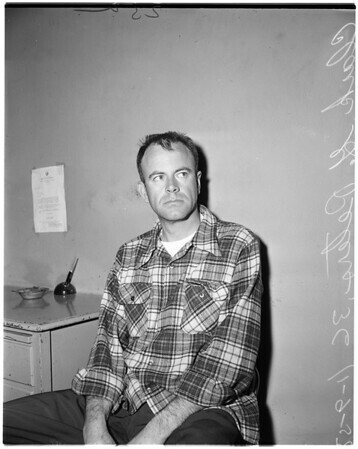 25-26: Former Pomona Police Officer Clark G. Peters, 36, who shot Willard N. Hall, 39, when he pulled butcher knife on him".